Shakespeare’s Globe Theatre is the most recognizable early modern playhouse and, as a result, the subject of numerous reconstructions and reimaginings. Currently there are more than fifteen reconstructions, with more being built. The last few years have seen a rise in ‘modernized reconstructions’ (or ‘modconstructions’) across the world. One of the most famous and influential replicas is Sam Wanamaker’s Globe, built in 1997 on the Southbank in London. Wanamaker, an American, credited his acting experience as a teenager on a replica Elizabethan stage at the Cleveland Great Lakes Festival as the beginning of his decades-long journey toward reconstructing the outdoor playhouse. The historical aesthetics of the reconstructed spaces offer audiences the chance to enjoy the ‘Shakespeare experience’. They speak to global audiences in a shared language, revealing a fascination with early modern Britain. Aside from the famous London reconstruction, a visit to the Globe theatre can now take place in Germany, Argentina, New Zealand, Japan, Italy, the United States, Canada, and the Netherlands, and the number of reconstructions and adaptations continues to grow. The motives for the replicas, and their funding differs for each site. The Italian theatre, for example, was built in the Villa Borghese gardens as part of a twinning project with London in 2003. Funding came from the Silvano Toti Foundation, which focuses on the growth of arts and culture in Rome. Frequently, the spaces are the result of the passion of an individual – like Shakespeare’s Globe in London. 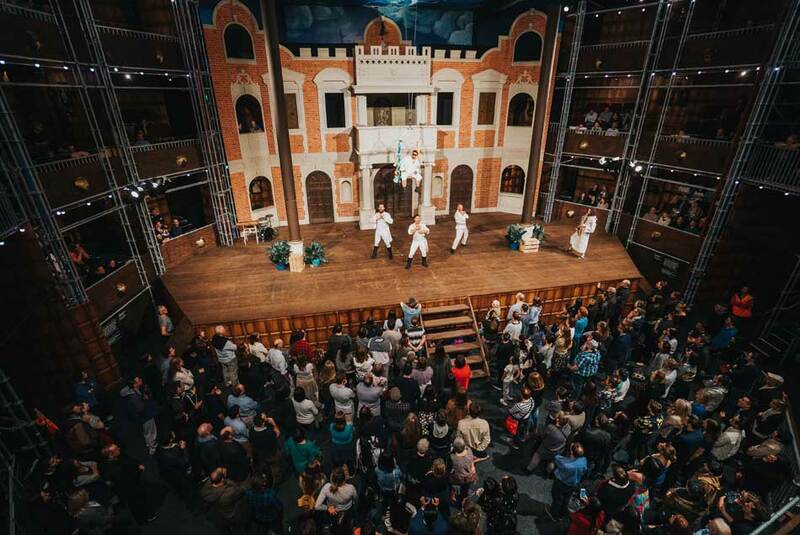 The 400th anniversary of Shakespeare’s death in 2016 saw a resurgence in modern re-imaginings, such as the Diever Shakespeare theatre in the Netherlands and the Pop-up Globe in Auckland, New Zealand, which offered audiences the chance to enjoy “Shakespeare like it’s 1614”. Unlike the London Globe, the Diever site in the Netherlands is completely enclosed with a glass roof which enables the company to be able to use the building year-round while maintaining the illusion of an open-air playhouse. Even with the glass roof though, the building is immediately recognizable as a replica of Shakespeare’s outdoor space. 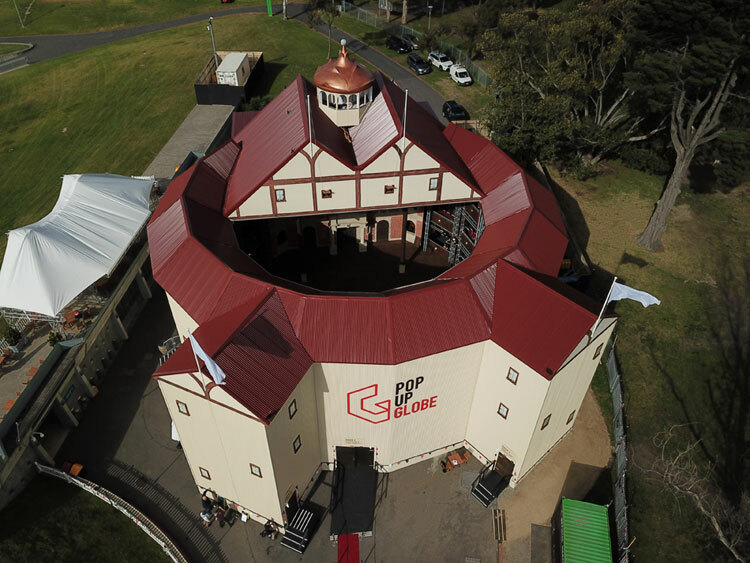 Courtesy of Pop-up Globe. Photo by Jeremy Fleming. During 2016, plans also progressed for the Container Globe theatre, which is to be built entirely from shipping containers and is marketed as a “punk reimagining of Shakespeare’s Globe”. The artistic interpretations of the completed Container Globe are as distinctively (and familiarly) ‘Globe-y’ as the 1997 London reconstruction. These replicas offer audiences a twenty-first-century Globe that enables them to understand the way seventeenth-century texts work in a space similar to the original. The Container Globe can be constructed anywhere with containers and scaffolding, and the crowd-funded project (which raised $42,553 of the proposed $50,000) is set to be constructed in Detroit, Michigan, in the near future. So why the Globe Theatre? Other spaces around the world offer theatre in the round or a thrust stage. What is it about the combination of shape, stage position, and audience proximity that creates theatrical magic? The draw, of course, does not lie in these things; what captures the imagination is the notion that the performance space, in so closely resembling Shakespeare’s original theatre, can reveal insights into the plays and how Shakespeare’s audiences first received them. All of the theatres, regardless of the differences between them, are marketed as spaces similar to Shakespeare’s original playhouse, although they may base that claim to similarity (or replica status) on different measures. For example, the Pop-Up Globe’s claim is based not on the materials used to construct the playhouse, but its dimensions. The shape of the space and the close proximity of the audience to the stage and, more importantly, to its actors creates a brief and intense relationship that can be found in all of the reconstructions around the world. These re-imaginings show us that physical space takes precedence over geographical place since the reconstructions do not need to be situated in London to be successful. The existing reconstructed playhouses directly inform the construction of the latest ‘version’. The Globe is not the only theatre from Shakespeare’s time to be reconstructed: the Sam Wanamaker Playhouse opened in 2014 as a reconstructed indoor Jacobean theatre, and Staunton, Virginia, boasts a reconstructed Blackfriars theatre. But it is the Globe’s distinctive shape that is appearing across the world. With each new reconstruction or reimagining audiences are offered new interpretations of Shakespeare’s theatre and his texts. They show us that audiences want that moment of recognition that comes from stepping inside a modern construction and finding yourself cheek by jowl with the past. We can expect to see many more ‘modconstructions’ of the Globe in the coming years. The variety of products used in their construction (containers, scaffolding, oak etc.) and their ability to continue to sell tickets shows us that 400 years later there is still an audience for (mostly) open-air, arena-style playing spaces that offer Shakespeare. It is this link to the Shakespeare of the past that drives these replicas and their audiences. Michelle Manning is a doctoral researcher at Anglia Ruskin University, Cambridge. Her thesis studies the differences between the Sam Wanamaker Playhouse in London, and the Blackfriars theatre in Staunton, Virginia. Her thesis examines the concept of the reconstructed spaces as academic arenas, and their impact on early modern scholarship.